463 backers pledged CA$ 12,576 to help bring this project to life. This adventure builds on the rules and information presented in the D&D core rulebooks and the D&D Starter Set, and on the first-time DM's experience of having previously been a player in the game. A beginning DM running the adventure will learn to think about the ways in which the story can go in different directions based on what the characters do — and how to not be scared when it does. They’ll practice bringing NPCs to life by way of interesting quirks, to help the players engage with and remember them. They’ll get tips on running fun combat sessions, building from an initial slate of simple, single-foe encounters to more complex fights. And they’ll learn to use humor as a tool to make the game interesting and memorable, especially for other younger players. In the vein of many classic starter scenarios, the adventure features a fully detailed local keep, where the characters meet and learn of the legendary lost ruins in the nearby wilderness. Those ruins then present a classic dungeon crawl in nine parts, featuring fifty different areas to explore, fun physical puzzles and daunting traps, a host of classic monstrous foes — including not one but two dragons — and other challenges that will bring the characters to 5th level… assuming they survive the threats of Hazakor’s lost halls. This isn’t a stripped down or simplified adventure scenario, and there’s no reason why experienced players and veteran DMs won’t also have a good time running it. 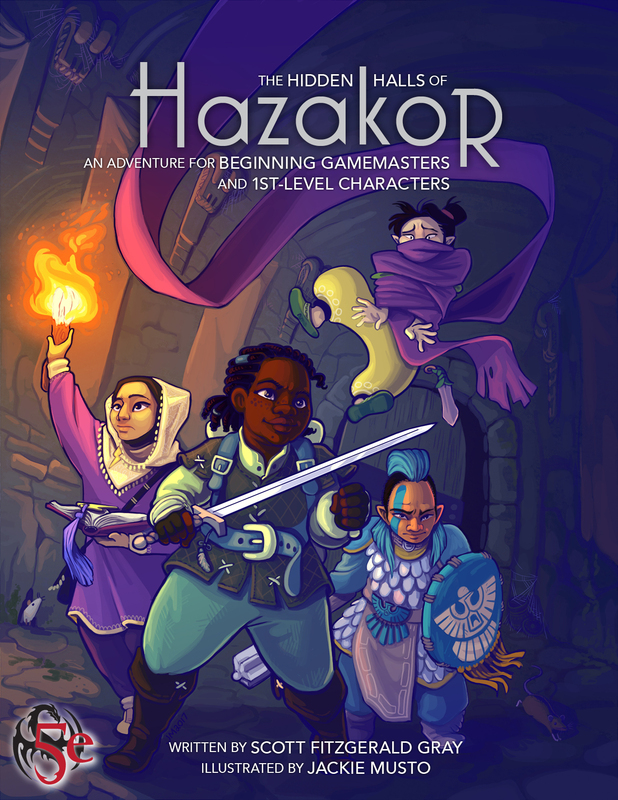 But The Hidden Halls of Hazakor has been designed and written with young DMs firmly in mind — helping them break down the processes of running an effective RPG session, creating a fun and dynamic world in the dungeon, and sharing that world and its stories as only roleplaying games can. Scott Fitzgerald Gray is a full-time freelance writer, editor, story editor, and RPG designer, whose gaming work covers three editions of the Dungeons & Dragons RPG — including working as an editor on all three core rulebooks and the Starter Set for D&D fifth edition. He’s written and edited upwards of fifty RPG adventures for Wizards of the Coast, Dungeon magazine, Schwalb Entertainment’s Shadow of the Demon Lord, Sly Flourish, Gamehole Publishing, Green Ronin, Frog God Games, and others, as well as producing adventures and gaming supplements on Dungeon Masters Guild under the Insane Angel Studios imprint. Jackie Musto is a comic creator, illustrator, and educator. She's been working for nearly a decade creating fantastical worlds, daring adventurers, and monstrous beasts, and spent her childhood lost in roleplaying worlds and games. While playing tabletop games as a teenager, her career path was decided — she wanted to be the person who drew the amazing illustrations that brought those games to life! Now it's her pleasure to fulfill her dream and help other young folks get entranced and creative with their own ideas and stories. Her webcomics Kay and P (the story of a girl whose best friend is a skeleton) and The Adventures of Lady Skylark (a sky pirate adventure) are found online at: www.kayandp.com and www.ladyskylark.com. “The Hidden Halls of Hazakor” will be available in both a full-color electronic PDF version and as a full-color print-on-demand softcover on high-quality 70# heavyweight stock paper. 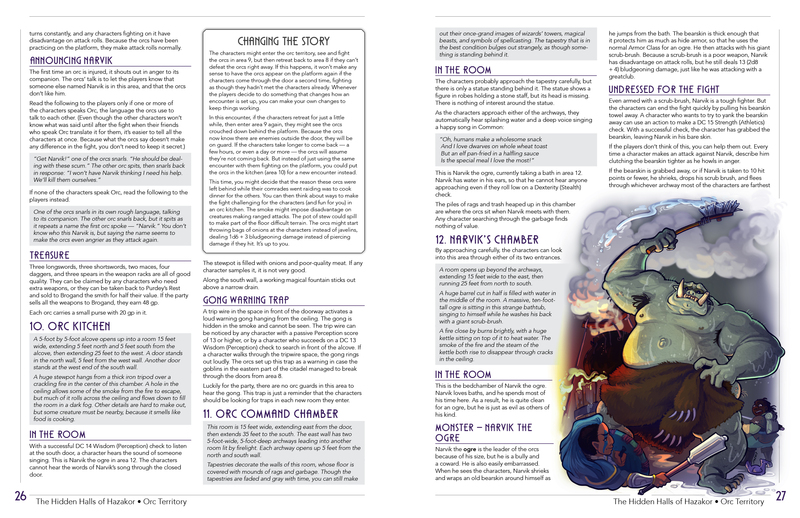 The print edition will be fulfilled by Drive-Thru RPG, which offers the most economical option for small-run RPG projects, high-quality paper and cover stocks, and amazing color through IngramSpark/Lightning Source — one of the world’s premier POD printers. And making use of print-on-demand technology means your book is shipped as soon as it’s printed — there’s no additional downtime as books are shipped from the printer to us, then reshipped to you. Beyond the base goal of the fully-illustrated adventure, we have a number of stretch goals on tap. At $14,500, the book gets even bigger — approximately 68–72 pages — in response to even more amazing art by Jackie Musto. At $15,500, $16,500, and $17,500, the adventure expands with DIGITAL STRETCH GOALS — three original side trek scenarios, each 4 to 5 pages with original art. Each side trek is designed so that it can tie in to the central Halls of Hazakor campaign, or be played as a standalone one- or two-session adventure. At $21,000, the book expands yet again — to approximately 76–80 pages —and will be bursting at the seams with the maximum amount of art by Jackie Musto. If we start to work through these additional funding levels, even more stretch goals and special surprises will be revealed during the campaign. Because Insane Angel Studios is a business entity based in the Great White North of Canada, Kickstarter policy means that we’re obliged to set up our project with pledge levels in Canadian dollars. This is part of the reason that our overall funding goal might seem high at first glance — but that $10,500 Canadian works out to approximately $7,300 US after Kickstarter fees have been deducted. If you’re backing the project from outside Canada, you should see your preferred pledge level (and shipping cost, if applicable) converted into whatever currency you’ve set up for your Kickstarter account — which means that American backers will see an effective price that's a fair bit lower in US dollars. 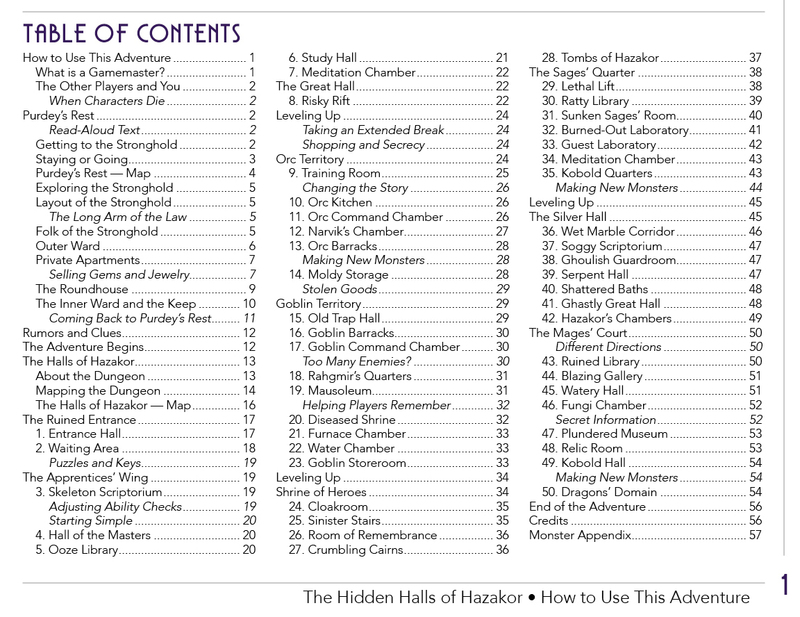 Moreover, after the Kickstarter, the PDF and print-on-demand versions of The Hidden Halls of Hazakor will be retailing for $10 US and $20 US, respectively — which means that no matter where you’re backing from, the Kickstarter gives you a sweet discount. Shipping costs for the print book have been estimated using Drive-Thru RPG’s estimated shipping costs and current Canadian dollar/US dollar exchange rates. If you’d like a print book shipped to any country not listed, please email insaneangel@insaneangel.com with your address information, and we’ll confirm the shipping cost from Drive-Thru RPG. The shipping cost from Drive-Thru RPG does not include customs or duty that might be applicable to your order, depending on your location. Drive-Thru RPG titles are printed by Lightning Source in the US or the UK, and will be shipped to your country from there (depending on which location you’re closer to). Neither we nor Drive-Thru RPG have any way to determine whether new books shipped to your country from the US or the UK are subject to duties, import taxes, or other fees. It’s up to you to determine this, and to decide whether ordering a print copy of the book is something you want to do. Backers wanting a print copy of the book in Canada and Brazil should also see the “Frequently Asked Questions” section for additional information. “The Hidden Halls of Hazakor” is already written and playtested. The timeframe for delivery covers only final playtesting and development, editing, and illustration. Although real-life issues might result in minor adjustments to the schedule, there are no expectations of being unable to meet the delivery timeframe. Writer and designer Scott Fitzgerald Gray is a full-time freelance editor, writer, and RPG designer, and understands full well the process of delivering work on schedule. Scott has been involved with a number of successful and on-time Kickstarter projects, including having been editor for Mike Shea’s “Sly Flourish’s Fantastic Locations” and “Sly Flourish’s Fantastic Adventures,” editor for Jacob Hurst’s “Hot Springs Island,” and editor and writer on a number of titles in Robert J. Schwalb’s monumental Kickstarter-backed “Shadow of the Demon Lord” RPG. You receive a copy of “The Hidden Halls of Hazakor” as a full-color PDF, plus any digital stretch goals. No additional shipping costs. You receive a copy of “The Hidden Halls of Hazakor” as a full-color softcover book, printed and shipped by Drive-Thru RPG/Lightning Source. Shipping for the book is in addition to the cost above, and is priced according to Drive-Thru RPG rates for standard shipping. Estimated delivery indicates the date at which books will be available to ship. Shipping time will then vary, depending on your location. You receive a copy of “The Hidden Halls of Hazakor” as a full-color softcover, plus a full-color PDF and any digital stretch goals. LIMITED REWARD! 10 BACKERS ONLY! In addition to receiving the All-Around Adventurer rewards (full-color softcover book plus PDF and digital stretch goals), you get the young adventurer of your choice heroically rendered as an original illustration by Jackie Musto. You’ll provide a reference photo of your child, grandchild, niece, nephew, ward, et al, along with their favorite character class and favorite colors. From that, Jackie will produce an original 5"x8" watercolor portrait of your child as an RPG adventurer. Shipping for the softcover book and the illustration are in addition to the cost above. Shipping for the book is priced according to Drive-Thru RPG rates for standard shipping. The portrait will be shipped straight from Jackie’s studio in a reinforced mailer. Estimated delivery indicates the date at which books will be available to ship. Shipping time will then vary, depending on your location.